Cast iron skillets have been used for hundreds of years and are known to be passed down from generation to generation. I’ve been lucky enough to inherit one from my Great Aunt Irene and my sister recently gave me two. Cooking in cast iron skillets is such a dream…they cook more evenly than typical pans, can work on the stovetop, in the oven, on the grill and even over fire if you are camping out. I’ve cooked everything from restaurant style steaks to cornbread with mine…I just love them! Cast iron does require a little different care than your regular pots and pans though. You should NEVER wash them in the dishwasher or soak them, and dish soap is a no, no too. 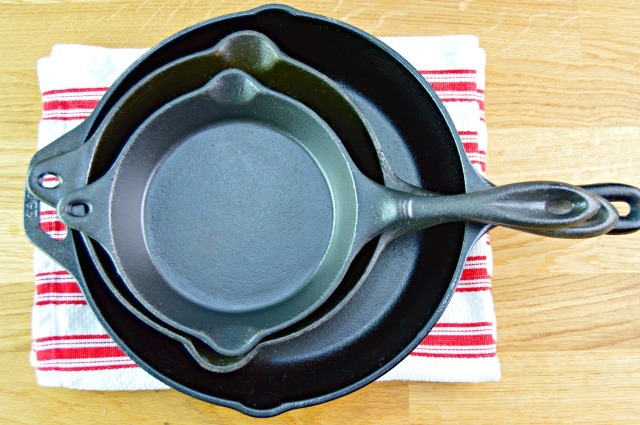 I’m going to share a super easy way to clean cast iron skillets whether it be in between uses or if you are like me and let yours sit a little too long in between uses and they have built up rust. This method also works for cooked or burned on food. This is my largest cast iron skillet…it’s been sitting in the drawer underneath our stove for a few months and has a few rust spots on it. 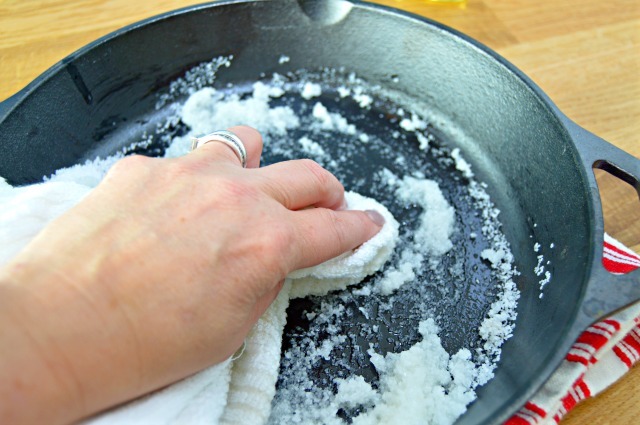 Start by using a clean cloth to wipe any loose dust or bits off of the skillet. 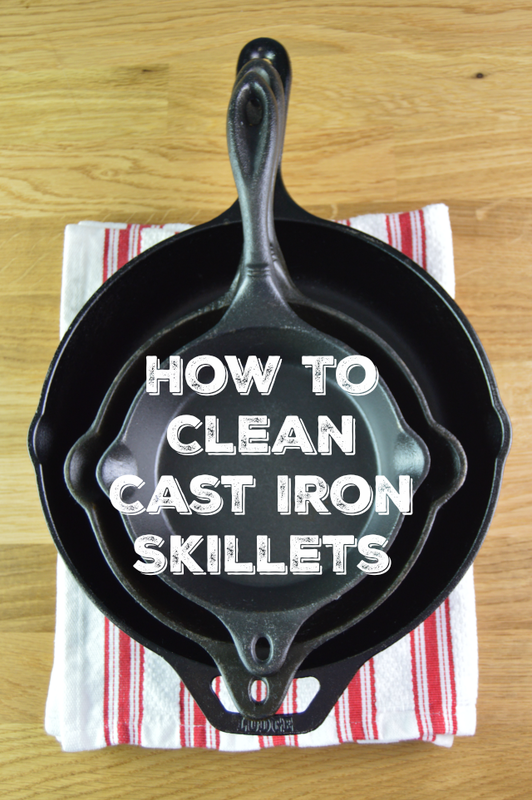 If you’d like to skip the pictures and just see how easy it is to do in real time, check out this quick video I put together showing just how easy it is to clean your cast iron skillets and how clean they actually get! Next, pour enough salt into the skillet to cover the bottom. Now, pour some vegetable oil onto the salt. You just need enough to dampen the salt. 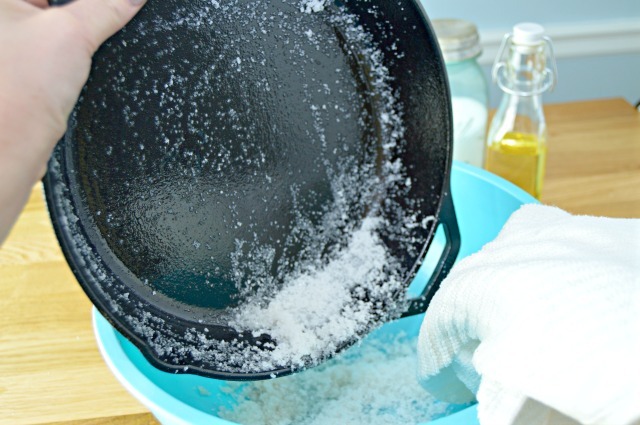 Use your cloth to massage the moistened salt into the skillet all over, especially any area that may have rust or burned on food bits. 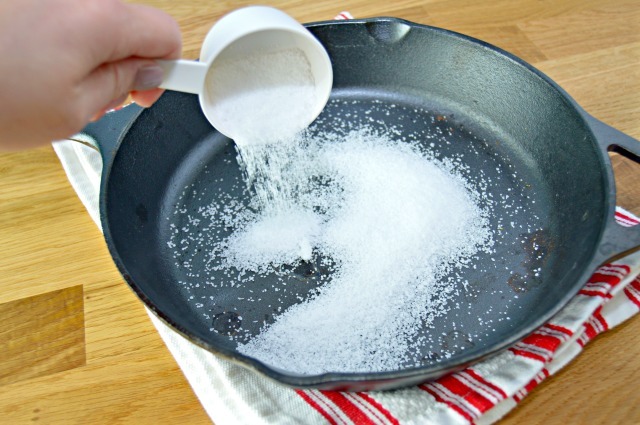 Once you have cleaned your entire skillet, use your cloth to remove all of the salt and oil. Then use a clean cloth or paper towel to wipe away any excess. Do not rinse under water. 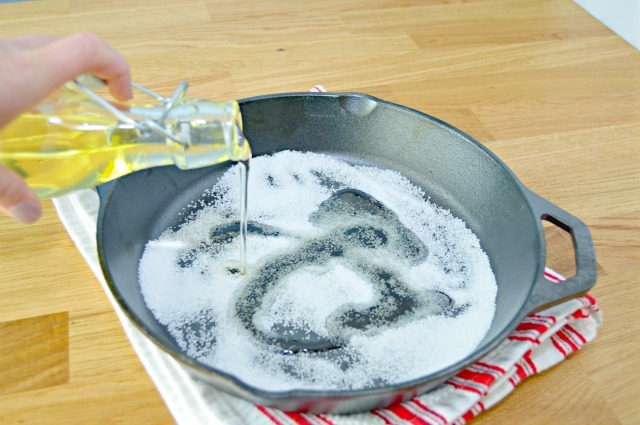 The oil you used will help to season the cast iron skillet and make it perfect for the next use. See…all clean! I’m going to place a soft cloth in between each skillet for storing this time so they don’t get damaged or rust any more. If you don’t own any cast iron skillets, they now sell them at almost every grocery and big box store. I’ve seen tons of different sizes and varieties at Cracker Barrel Stores and you can also find them at yard sales and thrift stores! 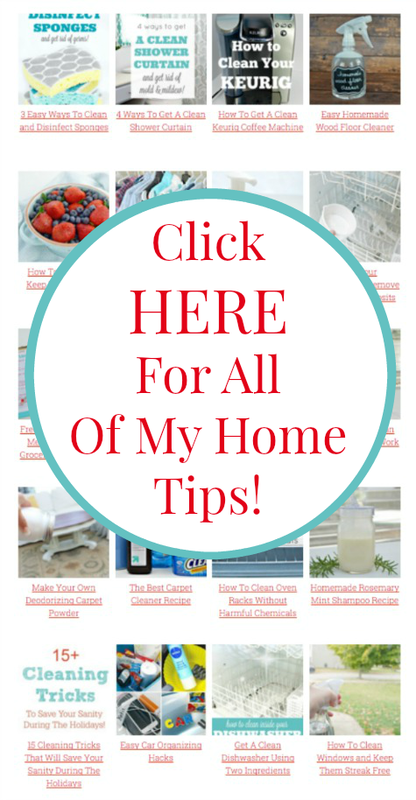 You can find this tip and hundreds more Cleaning Hacks and Home Tips HERE on my Home Tips Page! I love making cornbread with my cast iron skillet. I need to get another one soon and get it seasoned for fall and winter skillet dinners. Helpful how- to as always! I am fortunate to have 5 iron skillets that have been in my family for 3 generations. My Grammy taught me how to bake a pineapple upside down cake over 50 years ago. I still use that same skillet for that cake to date. My Mom absolutely loved making cornbread, biscuits, Johnny cakes, fried potatoes or apples in her skillets. Again, I find myself doing the same thing. We also use ours for steaks, hamburgers or porkchops. Thanks so much for sharing your love for iron skillets. I would love to have your pineapple upside down cake. I’ve been looking for that and a good johnny cake recipe for years. Please and thank you. I have been using them for 50 years. So glad ???? Mix up any cornbread recipe you have and I even use 2 boxes of mix when in a hurry, then I put a stick of butter (hold on it flavors an entire pan of corn bread) in a cast iron skillet and put the pan in the oven while the cornbread mix rests. The resting period makes better cornbread and when the butter is bubbling, I CAREFULLY take the pan out of the oven and pour the mix into the bubbling butter. Put it back in the oven to bake. OH MY MY MY MY You will have the tastiest crispest crust cornbread that needs no other butter!! Yes its sinful but I don’t make it but maybe once or twice a year for special meals. I only use very hot water and a scrub brush to clean mine. If cleaned IMEDIATLY after using then wipe with a paper towel. Better than any non stick pan in the world!!! Mine are still the best pans ever. All 7 of them, including a wonderful Dutch oven that makes the best pot roast in the oven when it isn’t hot weather. Don’t know why everyone says you can’t wash an iron skillet !!!! Some things you cook in it you will need to wash it, but you don’t want to soak it or put it in dishwasher that’s for sure…..if you make gravy in it….it has to be washed…..just add a little detergent to it ,wash it, dry it, sit it on a hot burner for a few minutes to dry well, then when it cools put it away…. Sometimes a skillet will get burned oil/grease on the outside…depending on what you use, so if this happens, you can burn it off by putting it in a self cleaning oven while you clean your oven and it will come out slick as a ribbon with no burned on grease on it anymore……done it several times it works…..
Have used iron skillets since growing up over 50 yrs…..was raised up with them……they are wonderful…..and they do make the best cornbread……and pineapple upside down cakes too…..makes great breakfast gravy too…..but just leaves the skillet messy and does have to be washed…..water is the enemy for iron skillet, but not if you wash it, dry it well and put it on a hot burner or in the hot oven for awhile……that way you have no problems …..the more you use it the better……..
….after you make your jalapeno, onion, olive corn bread, take and crumble it up and put it back in the skillet in a mound, layer chicken pieces like legs, thighs, wings, and breasts over the top of the mound, bake at 375° for about 1½ hours to 2 hours. The juices of the chicken drip down through the cornbread and make the most delicious dressing. Yes, cast iron is wonderful! However it is not all equal. Many of the newer pans for sale at many of today’s stores are not “Granny’s pan” quality. When at flea markets/Yard sales etc. look for the older pans…Griswold, Wagner. These are the “real deal” and worth the price and any clean up needed. Properly taken care of you’ll b passing them down as Granny’s pan. Will the sheet pan clean up work if what’s burnt on it is non stick spray? Thank you. I have the same problem with all my cast iron skillets. They have grease and oil build up on the outsidr. Have tried scrapeing it off to no avail. Your idea is great but I do not have a self cleaning oven. Have an old fashioned stove any other ideas ???? Your ALL CORRECT!!!! But the best is ( by All Chefs) isto clean with ccoarse salt and water if needed. Dry on HEAT (Gas or Electric); let cool. Then SEASON ONLY WITH OLIVE OIL Inside as well as all over outsde and bottom! NEVER USE VEGETABLE OIL………..Thank you and LOVE YOUR SITE! Louise….Missouri!…..
from Griswold and they are getting rare. 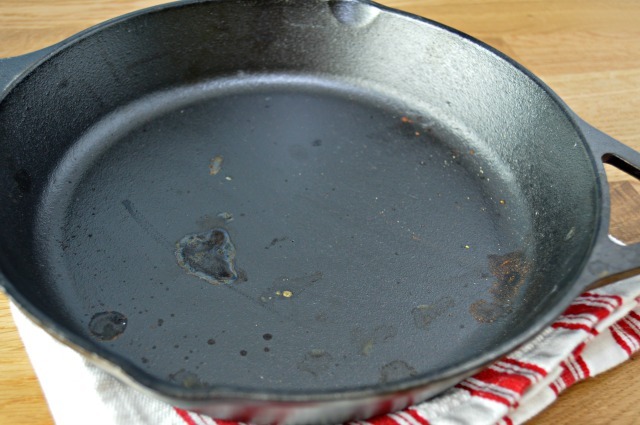 So how do I clean the outside of my cast iron pans?